Just when we think we have the Fenway area covered, a new nacho destination pops up like in a delicious version of Whack-A-Mole. One day, Fenway– one day, we will conquer you! We had been saving Jerry Remy’s Sports Bar & Grill for our final review but the nacho description at our intended destination The Baseball Tavern looked so repulsive that we turned tail and fled. On to Jerry’s, where the TVs are big and the portions supposedly even bigger. Appearance: (9.2) Oh, Jerry! Lots of colors, guac on one side, sour cream on the other, and a big ol’ vat of deep red salsa. It was hard to wait long enough for a photo! Quality of Ingredients: (8) For coming from a bar named after a local sports personality, these nachos were surprisingly humble. From their description we expected standard bar nacho toppings but were greatly impressed with some surprisingly interesting ingredients. The chili was delicious, with sizable chunks of juicy pork (or maybe beef? ), and the thickly pureed salsa had a wonderfully spicy chipotle flavor. 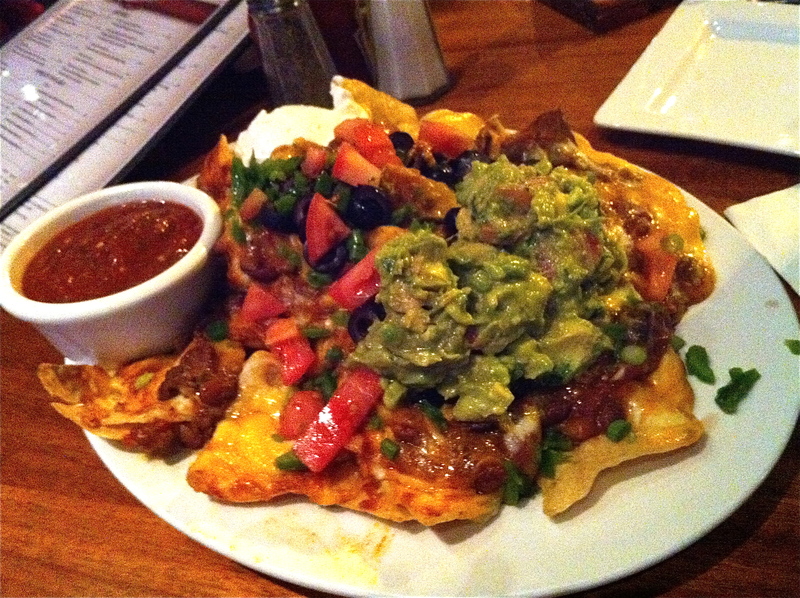 As we gazed across the street at Fenway Cantina, fond memories of Guacaholics Anonymous arose, and while the guac on these nachos was no contest winner, it was certainly tasty. Distribution of Toppings: (9) Chili and tons of cheese were (almost) everywhere, leaving just enough naked chips to sample the delectable salsa. Price: (7) At $13 with chili, and finished by two, these are a little high for Boston but not too out of place for Fenway. Overall: 33.2. Just when we thought it couldn’t be done…Game On! has some competition for the best ‘chos in Fenway!